1. Has writing always been your passion? If so, have you consistently pursued it over the course of your life? Yes, writing has been an essential part of my life for as long as I can remember. I kept a diary when I was seven and can still recall the mock-leather cover and tiny lock and key on the front flap. With my best friend at primary school who was a puppeteer, we staged plays for our long-suffering parents. I wrote my first (very short) novel at 12, a pastiche of David Copperfield. A friend of my parents kindly read and critiqued it and I felt like a writer for the first time. 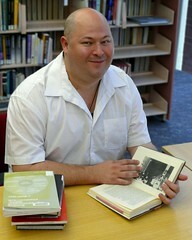 The second time was when I had a poem read on ABC radio. The lesson from my charismatic English teacher at a private boys’ high school was that writing was exciting, possibly even subversive. Catch-22 justified my dropping out of cadets while Lord of The Flies explained the behaviour of my fellow students. With my teacher’s encouragement, I contributed poems and short fiction to the slim ‘arts pages’ of the school magazine. Imagine my surprise when I recently reread one of these stories written when I was only 15: a tale of an elderly ballet dancer reflecting on her lost youth. And here I am, 40 years later, author of an intergenerational novel largely told from the point of view of women. For the next few decades, I kept writing in many forms. I co-wrote a children’s musical with a talented musician followed by four satirical cabarets performed at fringe festivals in Sydney and Adelaide and even for a season at Downstairs Belvoir Street. With development funding, we worked for some years on a serious two-act music-theatre work. My second partnership in the 1990s was with an experienced TV director. For Film Australia we researched and wrote two one-hour history documentaries shown on the ABC and overseas, both demanding and fascinating projects. I also had a longstanding interest in animation and collaborated with several talented animators in Sydney and London, writing scripts and proposals. Great fun! I wrote an adult novel just before my son was born in 1999. In 2010, I turned to novel writing again, focusing on children and YA. I was flying solo this time and I loved it. My agent submitted two titles to publishers but without success. Given my love of history and imaginative storytelling, she suggested I consider adult historical fiction. The result was Palace of Tears, my debut novel published by Allen & Unwin in 2015. It has been a long and interesting journey. I hope it continues. 2. Who have you met in your life that has inspired you as a writer? There are a few but I will mention two. The first person who springs to mind was not a writer though he enjoyed reading and respected writers. He was a neighbour and good friend, Peter Rushforth. Peter died two weeks ago at the age of 94, much admired and loved by a large community of friends and colleagues. He was a highly respected potter and teacher of pottery. His early years had been marked by suffering, orphaned by age 14 and then a prisoner-of-war at age 20 on the Burma-Thailand railway. Remarkably he transcended this experience by studying and teaching Japanese ceramics and working with Japanese potters after the war. In his essay The Good Pot (1979) Peter wrote “Myself, I have always been impressed with the advice of the Zen teacher ‘Develop an infallible technique and then leave yourself open to inspiration’.” I admired Peter’s serious commitment to his craft and his pursuit of beauty. In a small way I have been encouraged by his example to work hard on the craft and let the rest come. The other person who has inspired me is my wife, Claire, a talented essayist, journalist, short-story writer and novelist whose book When We Have Wings was published by Allen & Unwin in 2011. We have been together for over 25 years and yet we still surprise each other with our work. It has been an amazing experience to watch Claire’s development as a writer from her early short stories and journalism to the major achievements of her novels – a second one is now well advanced – and her short stories, long form essays and journalism today. She is a generous advocate for other writers she admires and serious-minded about the entire project of writing. I am daily impressed by her discipline and hard work, the breadth of her reading and interests and by the genuine passion she takes in her craft. It is a privilege to be her first reader. 3. Your new novel is set in the Blue Mountains – what is it about the Mountains that made you want to write with them as the setting? I have lived in the Mountains for over twenty-five years and have always wondered why more fiction was not set here. I wanted to pay my own tribute to this place’s great beauty and mysterious ambience, always seductive but also at times sombre and unsettling. I relished the challenge of writing about somewhere I knew so intimately, of overcoming the blindness of the familiar (I think my description of the annual winter solstice festival, Winter Magic in Katoomba, may be a literary first). I had in mind a family saga, a thrilling ‘sensation’ tale with a strong Gothic flavour. The Mountains appealed as the ideal setting for such a novel with its dramatic and eerie landscape. It is here that people are drawn from around the world to commit suicide from the clifftops. It is here that visitors become lost and perish in the vast belittling wilderness. It is here in summer that the peaceful bush transforms into a deadly, blazing nightmare. And then of course there is the Hydro Majestic, the grand and luxurious spa hotel opened in 1904 in the tiny township of Medlow Bath. Like so many locals I have always been fascinated by this unique, even eccentric, landmark building, a kind of antipodean madman’s castle. In my novel, I have created the Palace as a character in her own right, a fictional half-sister to the Hydro with historic people and incidents from the hotel’s real past enriching my own story. 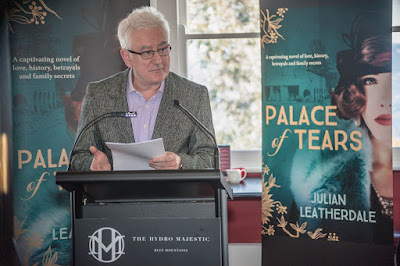 It was such a fitting and joyful experience to have the current owners of the refurbished Hydro recently host a high-tea book launch for me there. 4. How do you capture your creative ideas? Do you take a notebook everywhere, keep a diary, use some kind of software or rely on memory? Or something else? I have no magic tools, just piles of notebooks lying around where I jot down a few words here and there as an idea occurs to me or scribble notes as I read. I have sometimes even scrawled on the backs of envelopes or old shopping lists if I am worried it will slip away. Some of this handwritten stuff even makes it into computer files. The timelines and story arcs are always done by hand in almost indecipherable arrows, doodles and scribblings – it is the only way for me to massage and visualise the shape of the story. It all looks rather chaotic when I look back and I realise how much my memory and idle dreaming has sorted out the wheat from the chaff. I have become much more accepting of this serendipitous nature of creativity, happy to grab whatever comes to my attention and sticks there as inspiration. 5. Are you a methodical writer? Do you have a daily writing schedule? For my bread-and-butter journalism and marketing work I am rigorously methodical because I am usually working on very tight deadlines and to specific client briefs. I record and transcribe all my research interviews for long form articles which is time-consuming but gives me time to absorb the material properly. I always feel terrible pressure but I have never missed a deadline! The closest I got to a daily schedule on the three novels I have written is to try to start work no later than 10.00am. Both kids have been breakfasted and dispatched to school, I have had my morning coffee chat with Claire and taken care of adminis-trivia. Then I hopefully have five hours of solid work time until I pick up my daughter from school. The truly productive flow of writing can take two to three hours to start and then it is agony to be interrupted or have to switch it off. I try to pick up the momentum and work solidly again until about 6.00pm with a glass of wine as a reward. If the juices are really flowing I will do a night shift of writing until the well runs dry. 6. Do you think writing has some kind of mystical or therapeutic purpose? I am convinced there is something mystical in writing in terms of it serving human culture as a mirror of its own deepest currents of belief and value. We have so little insight into each other’s inner worlds, so few moments for exchanging truths that we are always second-guessing the mental landscapes of even our most intimate loved ones. Not to mention our neighbours, colleagues and communities. Stories describe and reveal those landscapes, even shape them. The way they do that is still profoundly mysterious to me. Writing Palace of Tears was my strongest experience to date of a power beyond ego or calculation or intelligence or any conscious control in the writing. The Muse knows the shape of your story and must be served faithfully. At times intensely pleasurable, at others a painful struggle, the writing process is for me the closest experience I have had to communion with a spirit beyond my comprehension.